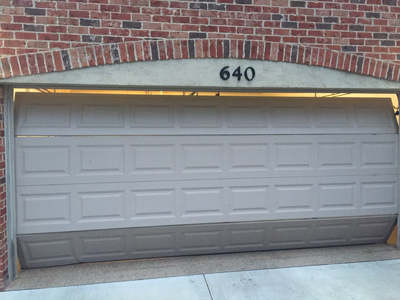 A broken garage door hinge is a problem encountered with swing, folding and overhead doors. It is usually caused by corrosion which could have been easily avoided with lubrication maintenance. Rust is the most common reason for the degeneration of hinges and other iron-based parts. Also, hinges tend to be damaged because of uneven weight distribution on the door, especially for up-and-over types. The weight of the door itself can eventually weaken the hinges. It is important to maintain balance to prevent the concentration of stress or tension on just one of the hinges. 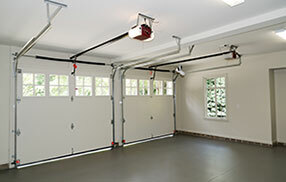 Broken garage door spring problems are encountered with roll up and sliding overhead garage doors. Similar to damaged hinges, they are usually caused by the uneven distribution of door weight. Also, garage door track obstructions or deformities can cause springs to prematurely degrade as they make it difficult for the door to move. Corrosion, likewise, contributes to the weakening of the springs. Accidents involving baseballs or hard objects thrown onto the door can lead to problems with the panels. It could be the deformation of aluminum panels or the breaking of a glass panel. Fortunately, panels are relatively easy to fix. You may only encounter difficulty replacing the panels of a roll-up door, especially for one that has been custom-made. The specific replacement panels may not be easy to source. Damaged garage door tracks can be attributed to a number of causes. It could be due to corrosion, getting hit by a hard object, or being accidentally hit by the car as it goes out or gets in. In most cases, professional service will be necessary. There are special tools and techniques needed to properly fix problems with bent or damages tracks.